When talking about software application monitoring, we should understand there is a large variety of applications in use; the term is general and deals with cases when application is a complex entity, often consisting of a number of interacting subsystems (services); fully automated or involving human interference. Thus the term ‘application’ in the current context refers to Web applications, both traditional interactive and AJAX-like; applications servers such as Websphere, JBoss, Zope and so on; database servers; corporate resource planning such as SAP ERP and so on. Application as a whole is hard to monitor unless all its subsystems are supervised and under observation. It means the conclusion on whether the given application is alive and works properly can only be derived from analysis of many services the application relies upon or consists of. In most cases the application should work uninterrupted, so the manual monitoring is hardly possible: there are too many data source to analyze and conditions to check for that automated network monitoring means only are able to handle the situation. 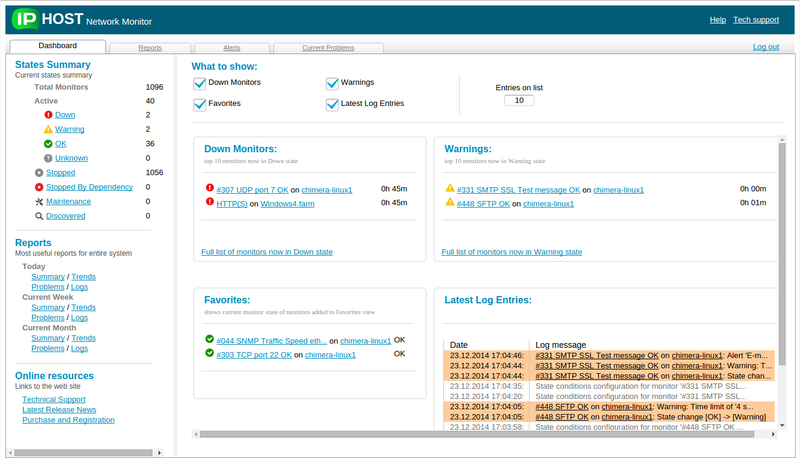 IPHost Network Monitor is able to handle it, allowing to detect possible or hidden problems. It is required that all the faults, inefficiencies and other non-standard situations be notified about as soon as possible. The personnel responsible for certain applications’ components functioning should be notified as soon as possible, before the customers start reporting malfunctioning and/or downtime. All the non-standard situations should be dealt with as quickly as possible. It means the monitors should be created in a way that allows to watch vital parts of the system and inform of possible problems capable of disrupting the whole service.Many software applications are under constant development, or are upgraded often. It means the developers and/or the operators providing all the support for the application should be notified about all detected inefficiencies, bugs and other problems. Thus periodic reports for the monitors become a must, since it is impossible to see the trends of resources usage without data collected for significant amounts of time. To provide an example, let’s assume the application in question uses database server, Web server and a multimedia streaming server. Given that the following network monitor types can be used: TCP, UDP, HTTP, database monitor, Web Transaction Monitor and SNMP Traps, among others. TCP monitor is used to check the basic availability of a service (protocol), namely by attempting to connect to the specified port. This simple action should be a dependency for more complex monitors: no need to run those if the service is basically unavailable. 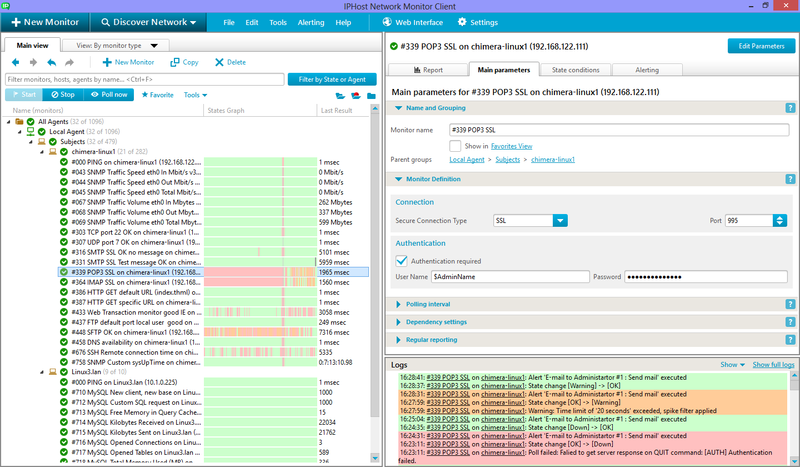 UDP monitor serves the task similar to that of TCP monitors. In many media streaming applications UDP is widely used to evade much overhead brought in by TCP-based protocols (at the cost of possibly losing some data). HTTP monitor allows to check for a particular URL presence, including checking for certain content and response codes. It should be used as a prerequisite (dependency) monitor for Web Transaction Monitors. HTTP monitor is good enough for one-step checks where no convoluted interaction with user is expected. Database, e.g. Oracle monitor can be used to both make sure the database engine is available and running, and to run queries to check certain conditions. In database-driven application database monitor are perhaps the workhorse of all the monitoring. Web Transaction Monitor is a developed version of HTTP monitor, allowing to imitate user’s action (opening Web pages, filling forms and sending them). It can be quite useful when authentication is required to reach certain site’s pages, and/if sending data is required to reach a certain page. SNMP Traps monitor is the real-time alert means, since it defines what program or script to run when certain conditions are met. Since it is possible to define any monitored SNMP value as an output of arbitrary program, SNMP Traps can be the means to issue immediate alerts about any non-standard situation. If both email and alternate means of alerting are used, this monitor type can notify persons in charge as quickly as possible. Note that the actual monitors depend on the application to be supervised and the actual services depending upon it; it is impossible to propose the optimal set of monitors even if the underlying application is known.